Join us for our Current Issues in LGBTQ Health lecture featuring Dr. Lauren Beach! This lecture will be on Monday, March 18 at 251 E. Huron Street, Chicago, IL in the Feinberg Pavilion (Conference Room A). Refreshments will be served. This event will not be available to stream via BlueJeans. CNE credits will be available to Northwestern Medicine providers for this lecture through NM Academy. For more information, please contact Grace Motto. Lauren Beach, J.D., Ph.D., (she/her) is a postdoctoral research fellow at ISGMH in the research group of Dr. Gregory Phillips, II. Scientifically, Lauren investigates how stigma affects chronic disease management and health outcomes in LGBTI populations. 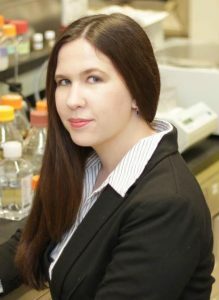 As an alumna of the Joint Degree Program in Law, Science & Technology, she received her JD specialized in Health Law & Bioethics from the University of Minnesota Law School in 2012 and her PhD in Molecular, Cellular, Developmental Biology & Genetics from the University of Minnesota, Twin Cities in 2014. For her PhD dissertation research in the lab of Dr. Louis Mansky, she studied the molecular mechanism of action of how ribonucleotide reductase inhibitors inhibit HIV-1 and HIV-2 replication. She received a BA in Social Relations and Policy and a BS in Microbiology from Michigan State University in 2007. Prior to joining Northwestern, Lauren served as a postdoctoral research fellow in the research group of Dr. Kerri Cavanaugh, as well as the Director of LGBTI Research at Vanderbilt University Medical Center. From 2014-2015, she was an HIVCorps Public Health Fellow at the Center for Infectious Disease Research in Zambia (CIDRZ), in Lusaka, Zambia. Lauren is a member of the Minnesota bar and a founding member of the Bisexual Research Collective on Health (BiRCH). At the invitation of the Obama administration, she has spoken at the White House to present recommendations for improving bisexual health outcomes and bisexual data collection methods. When not in the office, Lauren enjoys spending time with her 100 pound St. Bernard mix dog, Danny, playing piano, and vegetarian cooking. Read more about Lauren’s work.